For an intermediate state it look promising. Thanks for the update. I miss threaded conversations, any structure (e.g. accounts, smart folders etc.) 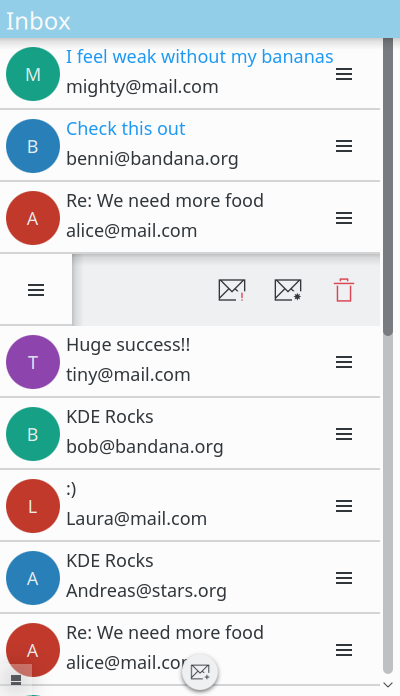 with the option to search or filter, quick preview of the mail content, integration of other modules (calendar, address book), and much more. I also worry about placing reply features (cannot guess from the small decorators, i.e. exclamation mark, and fav star, what function is underlying) next to delete (trash bin). And a smaller FAB button compared to the items gives the wrong visual cue, IMHO. Threaded conversations are in the making. Currently folder/smartfolder navigation and search are in the global side drawer on the right. We probably want to put the folders in the page row navigation though. Integration with modules will likely be implemented as a “share” feature accessible through the right (context) side drawer. Reply will be available once you click on the mail and get to the mail view. The quick(swipe) actions are “mark unread” / “mark important” / “delete mail”. We are likely going to make them configurable in the long run. The FAB button will have the normal size, once it is on a phone. Looks really nice. The only problem I see is padding on the right side of the icon – I think it should be a bit bigger. I have yet to go over this with someone form the VDG to make it pixel perfect. As I told you I’m not a big fan of this useless (M) (B) (A) circles which are by the way to big. It doesn’t say anything but you focus the UI to the circles. Use different colors for how often you get mails, is it important, if there is an avatar use the avatar with an cirle with the important color, use the circles for show usefull informations. We have plans for the Avatar area that go beyond big colored circles. Take a look at https://phabricator.kde.org/M22 for more information.